Hudson McFann (BA, geography, ’10) will be attending the U.N. Commission on Sustainable Development in New York. He is participating in the panel on sustainable development with 12 other youth delegates affiliated with SustainUS, a youth network that empowers young people to contribute voices to policymaking at both grassroots and international levels. McFann, a native of Columbus, was selected from applicants across the country to represent the SustainUS youth delegation to the Commission. The talks, which take place May 2 through May 13, will focus on sustainability in transport, chemicals, waste management, and mining. In addition to those four thematic issues, delegates will also discuss the 10 Year Framework on Sustainable Consumption and Production. Part of McFann’s goal in attending is to highlight the unique perspective that youth bring to the negotiations. He is particularly interested in the role of waste management in environmental and social justice. “Internationally, waste continues to disproportionately impact communities lacking sufficient political power to have their concerns heard and acted upon,” said McFann. While attending Ohio State, McFann served as president of Students for a Sustainable Campus, founded an educational forum called Green Beans: Ecology & Coffee, and served on the President’s Council on Sustainability Advisory Group. 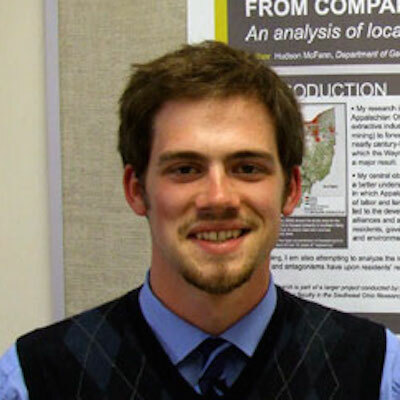 During his two years of honors thesis research, Hudson studied the sociopolitics of landfills and waste imports in Appalachian Ohio, focusing specifically on connections between mining and waste disposal. McFann is currently attending the University of Toronto in Canada, as a Fulbright Fellow. Hudson McFann (BA, geography, ’10) is studying at the University of Toronto on a nine-month Fulbright Grant. McFann’s work focuses on sustainability and environmental issues. As an undergraduate majoring in geography, McFann tackled the subject of resource extraction in Appalachian Ohio, studying not only the environmental effects of mining, but also the social perspective--how the area's history of mining led communities to distrust the government's authority. To complete the research, McFann made many trips to southeastern Ohio, where he interviewed community members and labored through historic archives. Since graduating last summer, McFann moved to Toronto to continue his research through a Fulbright Fellowship. He is studying the city's shipments of waste to landfills in Michigan and southwest Ontario, where host communities argue that Toronto’s exports are inequitable and locally detrimental. With support from Fulbright Canada, he is also benefiting from an incredible cultural experience- better appreciating the country’s diversity, and better understanding his own position in the world.